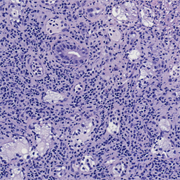 A 61-year-old male presented with erosive lesions involving the hard palate and sinus. 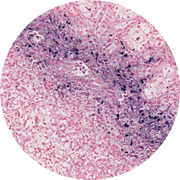 Histologic sections of the hard palate biopsy showed ulcerated epithelium and atypical lymphoid infiltrate involving minor solid salivary glands and adipose tissue. 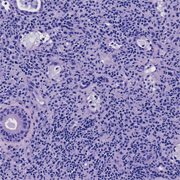 The lymphoid cells were intermediate in size with a small number of large atypical cells present. Flow cytometric analysis was performed and showed an abnormal lineage population, which expressed bright CD 45, bright CD 56 and bright CD2, and was negative for surface CD3, CD57, CD4, CD8, CD16, CD7 and CD5. Immunohistochemical studies demonstrated the neoplastic cells were positive for CD2, CD3, CD 56 and granzyme B, and were negative for CD4 and TdT. In situ hybridization analysis showed the neoplastic cells were positive for Epstein-Barr virus encoded RNA (E BER). In summary, the morphologic and immunophenotypic findings support the diagnosis of extranodal NK/T cell lymphoma, nasal type.